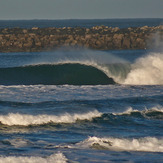 Detailed South Oregon surf forecast maps and the latest eyeball surf report from local surfers in the region. Near-shore swell is shown on the map together with the surf forecast rating for spots in South Oregon. Find the best places to surf in offshore conditions by selecting the wind option on the forecast map. 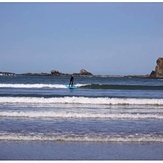 Windsurfers and kite surfers can also use this option to find more favorable cross-shore conditions in South Oregon. Our local Wavefinder indicates where some of the best conditions are likely to be found in South Oregon over the next 7 days. 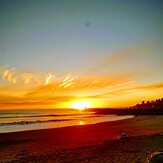 Surf photos from South Oregon and reviews of the best spots and surfing conditions have been provided by local surfers. All map types that you can enable here: South Oregon Colour Base Map, Wave Height, Wave Energy, South Oregon Swell 1 Energy, Swell 2 Energy, Windwave Energy, South Oregon Precipitation, Wind, Temperature, South Oregon Cloud Cover. Map overlays available for display: South Oregon Pressure, Wind. Symbols shown on the map: South Oregon Surf Breaks, Tide Forecasts, Cities, South Oregon Ski Resorts, Live Wave Buoys, Live Webcams, South Oregon Wind Now, Temperature Now, Weather Now, South Oregon Swell at breaks, Rating at breaks. South Oregon Surf Forecast map for predicting the best wave and wind conditions across the region. For surfers, the map shows the most powerful swell tracking across near-shore open water and not the peak waves experienced by boats out at sea. Move your mouse over the ocean swell symbols or the surf breaks on the coastline to see a more detailed surf forecast including wave period and wind conditions. The forecast updates every 6 hours and most live weather reports update every hour. You can animate the South Oregon Surf map or show live wind and wave conditions as reported from wavebuoys and local weather stations. 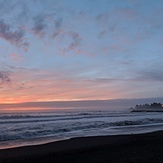 Surf breaks shown along the South Oregon coastline are also listed below. 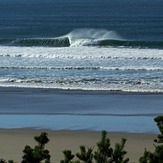 Oregon South is open to some big swells and is often pounded with some good surf. With more beaches than you can count there are plenty of options to choose from. Most breaks are sandy beach breaks although there is a mixture of reefs and points. Typically finding a good wave can be quite the challenge though. Big swells that come out of the NW hit the whole of the coast and lighten up several man made spots which have protection form the wind, such as jetties. Sharks and other wildlife are quite common. Water temperature is quite low all year round so a winter wetsuit is needed.